Mini Dental Implant Dentist Buffalo NY: Mini Dental Implants Cost Less Than Regular Implants...Why? 24 months 0% Financing available for all implant procedures! Dr. Benjamin D. Oppenheimer is a graduate of the University at Buffalo School of Dental Medicine. There he received a Dean's letter for Academic Excellence as well as the International Congress of Oral Implantologists award. He is now one of the leading experts in the world on Mini Dental Implants and a fellow of the ICOI. He has taught hundreds of dentists to use minis and has served as a consultant to the IMTEC Corporation, the manufacturer of the MDI product as well as Dental tech laboratories, Evolution Dental, Global Dental Sciences. He currently is a Key opinion leader to 3M ESPE Dental Implants. He is also the author of a number of scientific journal articles on the subjects of dental implants, bone grafting, mini dental implants and Cone Beam CT for dentistry. As well as offering dental implants, Dr. Ben provides all aspects of patient care for adults and children in Amherst, NY a suburb of Buffalo NY. He focuses on dental implant treatment in his buffalo office. Dr. Oppenheimer has also served as a business consultant for Jenius Industries Inc. and VBS Holdings LLC. He currently is a Member of Apex dental solutions, LLC, a mini implant marketing agency. Mini Dental Implants Cost Less Than Regular Implants...Why? Mini Dental Implants cost significantly less than traditional large diameter implants. How can this be? Dentists typically set their fees based on the prevailing fee in the area. This is sometimes related to the dental insurance reimbursement rate for that specific procedure. But that's not the whole story. Fees are generally set by looking at costs of materials involved and also dentist time. So, lets take those two categories and apply them to mini implants while comparing them to standard or traditional dental implants. The mini dental implant is a one piece titanium screw that comes sterilized from the manufacturer. One piece refers to the pre-attached abutment piece. That is the piece that protrudes above the gum-line. When these pieces are made together it eliminates extra steps in the manufacturing process and decreases the manufacturing expense for the implant producer. Only one drill is used which decreases the cost of the placement kit. Drills tend to be $60 or more and most kits can contain up to 15 drills. No bone grafting is needed for mini implants. Sterilized cadaver bone or synthetic bone can cost hundreds of dollars to procure. There are few special impression pieces or extra transfer parts that are used to make the denture or crown. These laboratory pieces and dramatically increase the cost of the restoration be it a denture, crown or bridge. That extra expense is used to calculate the price to the patient. 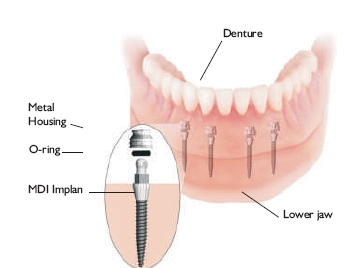 The cost savings of mini implant procedures is realized by the dentist. With less overhead to the dentist, he or she can easily decrease the cost to the patient. All dental treatments take up "chair-time", that is time spent in the dental chair. Dentists need to provide their services and make them profitable so they can pay for materials, staff, rent, electricity etc. The good news is, mini implants take much less chair- time than standard implants on average. Lets look at the procedure. 1. Mini implants are placed local anesthesia (a simple shot). Although some patients may request sedation for implant procedures, this is typically unnecessary and increases the time and cost of the implant procedure. 2. Mini implants are placed without an incision and flap. That is an extra step typically required with standard dental implants. It also requires sutures or stitches at the end of the procedure which can eat into chair time as well. 3. Only one drill is used with the procedure. This increases the speed to the finish of the implant procedure. 5. The MDI implant can be used immediately without the need to wait for healing. This means that the surgery and restoration can be combined into one visit and although it may be a bit longer, multiple office visits and scheduling costs the office more. 6. Follow up visits are time consuming as well. mini dental implants require fewer follow up visits than standard implants. There is no suture removal visit. Fewer relines because there is very little change to the underlying bone and soft tissues. When evaluating the costs of mini implants with the above information, it is clear to see why there are significant differences in price from standard dental implants. One additional factor to consider is that there may be a "best implant for the job". There are many different implant sizes and shapes that are most appropriate given the patient situation. Maybe a standard implant is the best choice? Maybe a mini? Either way, mini implants offer significant advantages in the right circumstances. Schedule a consultation with a mini implant dentist to evaluate your options. To find a dentist near you visit http://www.minidentalimplantsolutions.com or call 888-258-6085. Stabilize a loose denture in about an hour!